Ultra-light translucent crème, with orange oil scent. Use twice daily after cleansing and toning. 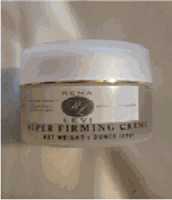 Apply all over face and neck, concentrating on eyelid, under eye, and jaw line for extra firmness. Clinical studies confirm the effectiveness of this high performance crème, showing the reduction of superficial facial lines by 36% within 4 weeks, and increasing skin firmness by 21% with 4 weeks. This high tech complex provides ingredients, which help firm and tighten aging skin while providing enhanced texture and the reduction in the appearance of wrinkles. High doses of Vitamin E and Sodium Hyaluronate help protect and hydrate. Apply twice daily to face and neck, concentrating on special areas in need of extra firmness such as the eye area and jaw line. Can be used under your normal moisturizer. Coneflower Extract – (Echinacea purpurea) has been shown to have strong anti-inflammatory and immune enhancing properties. Hydrocotyl Extract – (Centella asiatica) also known as Gotu Kola, are known to have healing properties. Vitamin E – Anti-oxidant. Maximum dose incorporate in this formula to help nourish and skin and protect it from the breakdown of premature aging caused by free radicals. Panthenol – Vitamin B5, known for its revitalizing effect to the skin. Sodium Hyaluronate – Maximum dose incorporated in the formula known as an excellent humectant and emollient which moisturizes, lubricates and soothes skin.